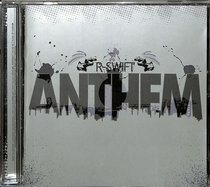 :With Anthem, Bible teacher and music minister R-Swift once again uniquely conveys a timely message in a way that will convict and challenge believers and non-believers alike to sing and to live His message. Laden with heavy-hitting hiphop rhythms and clever, Christ-centered rhymes, Anthem delivers the spiritual goods to a generation of God-thirsty listeners. R-Swift is a Christian rapper, a New York native who now resides in Philadelphia. Hi albums include Soapbox, Anthem and Apply Pressure.